Going solar isn’t green if you cut down tons of trees. Companies like Six Flags are cutting down trees to make room for solar panels—and missing part of the point of environmentalism. The big drops aren’t the only hair-raising things at Six Flags Great Adventure. The plan, the largest solar installation in New Jersey, will generate 21.4 megawatts of electricity, enough to power the amusement park’s Garden State facility. The company projects that the initiative will eliminate approximately 215,000 tons of CO2 emissions over 15 years, a result that it says more than compensates for the loss of trees. Local residents and environmental groups—including Clean Water Action, Crosswicks/Doctors Creek Watershed Association, Environment New Jersey, NJ Conservation Foundation, Save Barnegat Bay, and the Sierra Club—beg to differ, claiming that razing nearly 15,000 trees will adversely impact water quality, air quality and sound quality; decrease the wildlife population; and affect biodiversity, as the state loses a section of forest known as the Pine Barrens. “As green as solar is, you don’t get a pass for chopping down a forest,” said David Pringle, campaign director for Clean Water Action. “If they kept the forest and put the panels in a parking lot, you get all the benefits of solar without any of the costs of clear-cutting the forest.” State officials even offered to buy the land to stop Six Flags from deforesting it, but the company declined their offer. However, experts say there isn’t a lot of data on panels leeching heavy metals into soil or water. Vasilis Fthenakis, a senior scientist at the Photovoltaic Environmental Research Assistance Center at Brookhaven National Laboratory and a professor at Columbia University, went so far as to call the contamination argument a myth. “Nothing can come out from the panels when they operate. Nothing,” Fthenakis said. “They’re well-encapsulated. They have to be, to withstand weather.” Only if the panels were crushed into tiny pieces and left out in the rain for at least a year could something leech out, Fthenakis said. And given that the panels are presumably being installed by someone who wants to make money off of the power they generate, that company is going to notice if one of its panels isn’t working anymore, he said. “Obviously, whoever is the one who owns the system put it there for a reason: to make money out of the electricity. And that electricity production is very well monitored. If something is damaged, you’re going to see it on the power output,” he said. So not all of Shapiro’s concerns are backed up by the science—but she is correct that a seemingly green project like a solar energy farm can have negative environmental impacts if not planned out carefully. While there’s not a lot of evidence of hazardous materials being released while the panels are in use, concerns have been raised about heavy metal exposure in the manufacturing process and when they are discarded at the end of their useful life. And there are other environmental concerns, too. A recent study in Renewable Energy found that as many as 138,600 birds have been killed at what the researchers call Utility Scale Solar Energy projects—either from birds flying into panels or being singed by exposure to concentrated sunlight—and if all of the large-scale projects currently planned are built out, that figure could rise to 480,000 annually. A 2011 study in BioScience found the construction and eventual decommissioning of solar energy facilities can cause animals to die and habitats to be destroyed or modified. The actual operation of the facility can destroy or modify habitats, and cause increased noise, electromagnetic field generation, microclimate alteration, pollution, water consumption, and fire. “I think the major environmental issue here is that deforestation undermines the greenhouse gas benefits of the solar project,” says Dustin Mulvaney, an associate professor in the environmental studies department at San Jose State University. 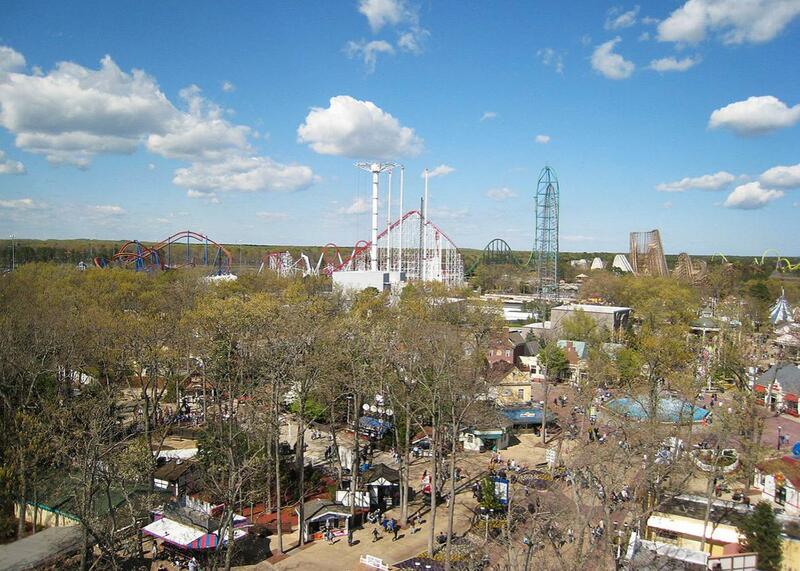 Six Flags wouldn’t be the first corporation to cut down trees to make way for solar panels. In the past six months alone, there have been similarly controversial solar farm projects in Suffolk County, New York; Rochester, Massachusetts; and Kona, Hawaii, among others. The Long Island project is the largest of the lot: A California company plans to convert five county-owned parcels into solar energy fields, to provide power for the county jail, police headquarters, and other county buildings. San Mateo–based SolarCity will build the farms on 130 acres that combined will produce 13.5 megawatts of power and save the county $1 million a year in energy costs savings, though it requires the clearing of 34 acres of woods. In Rochester, a company called NextSun Energy is planning a 6.5 acre solar field on a former dairy farm in the middle of the town’s historic district and plans to cut down all trees more than 20 feet tall so that they don’t block the sun from hitting the panels, including those in a nearby cemetery. Some 29 states and the District of Columbia now have renewable portfolio standards in place stating that a certain minimum amount of renewable energy such as wind, solar, biomass, or geothermal should be used to generate electric power, and those figures rise over time. The result has been exponential growth in solar energy projects, with the number of installations—residential, commercial, and utility-size—having doubled since 2013, says the Solar Energy Industries Association. Mulvaney says private companies are leasing large swaths of undisturbed land in the Southwest, three or four miles wide, that are full of old-growth cactus, yucca trees, and in some cases, Joshua trees, scraping them clean with these large machines that clear away all the vegetation, and then installing 8 million or 9 million solar panels. The power is then sold back to the utilities, so that they can meet their federal renewable energy mandates. Mulvaney says that in the calculus of reducing carbon emissions, constructing solar panels puts your project in the red from an environmental perspective. It takes several years for the benefits of reducing carbon emissions to come to fruition. When you clear trees as part of the project, it takes that many more years for the project to come out of the red and yield any benefits. “We have found ourselves in a situation where we’re trying to protect the climate and in reaction to that, we’re forgetting about the land,” he said. So if you find yourself sitting in a roller coaster creeping upward this summer, you may want to think about what’s powering it. “Green energy” sounds great, but if consumers and companies focus on it without thinking about the larger environmental context, they may miss the forest for the trees.